Who said bigger is always better? These shrunk down, ramped up versions of Mabef's M-27M and M-29 Field Easels offer the same quality in a convenient, compact package. Carefully constructed of oiled beechwood, these portable easels can be adjusted for floor or table use, yet fold up small enough to fit in a bag. The pivoting canvas holder allows you to adjust the working angle to any point between vertical and horizontal. Both easels are equipped with two canvas holders, which allow you to work on two canvases at once. Both Mabef Mini Field Easels accommodate a minimum canvas height of 21½", a maximum canvas height of 39½", and support a maximum of 11 lb. Their overall maximum height is 73¼", folding down to just 21½" long for storage and transport. 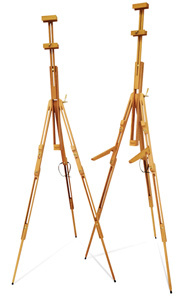 Basic Mini Field Easel MBM-29M — This is a miniature version of the Mabef M-29 Large Basic Field Easel. 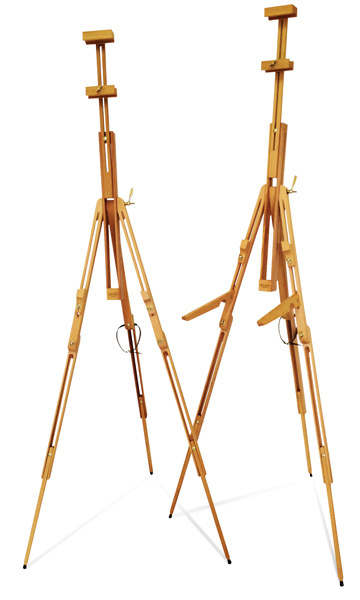 Mini Field Easel with Arms MBM-27M — This miniature version on the Mabef M-27 Field Painting Easel is identical to the Basic Mini Field Easel with the addition of two folding shelf brackets designed to support a pastel box.